One quote widespread in the Arab region, a few decades ago, was that it was facing the danger of ‘partitioning what has been already partitioned. Those days, several Arab capitals were run by leaders who cover their tribalism and sectarianism by claiming to be ‘Pan-Arabists’ as well ‘Anti-imperialist Globalists’! No doubt the region was affected by the demise of the Arab Nationalist project after the defeat of 1967, and later the end of the ‘east – west’ rivalry in the late 1980s and 1990s as a result of the collapse of the ‘Berlin Wall’ and later the USSR. Thus evaporated all fake slogans, and emerged the true chemistry of most of these regimes. It did not take long before the discourse of armed ‘Political Islam’ began establishing itself at the expense of that of ‘Arabism’ and the ‘liberation of Palestine’ as well as globalist discourse of the Socialist Left and Liberal Right. However, there was no place for any armed groups under state authority; which meant that this kind of armed ‘Political Islam’ – namely, Sunni – bolstered by some electoral successes, became the ‘democratic choice’ in the struggle for political change against regimes unwilling to accommodate reform. On the other hand, the states’ legitimate armies and security forces (and later Shi’ite militias, as we have witnesses in Iraq and Syria) became the effective means of stemming the tide of Sunni ‘Political Islam’. What has been called the ‘Arab Spring’ has been a turning point. Why seek change if the human, political and economic cost was so high? What’s wrong in tolerating dictatorships if the alternative is chaos? Aren’t we immature nations that hardly deserve democracy anyway .. so why ask for what we don’t deserve? Why must we show empathy with other suffering Arabs who trouble us and let us down instead of looking after our own interests? And last but not least, what’s wrong in being weak – even against regional challenges – when we can always rely on Super Powers that are always ready to protect us? I reckon that being able to address these questions would ‘enrich’ our political culture, and refocus our outlook to the challenges faced by the Region and its peoples. On a negative note, however, we are approaching these questions neither in a responsible way nor with a commitment to accountability. For example a lot has been written about the Palestinian Conflict and the ‘nature’ of Israel to the extent that many have lost interest. Later, we lived and continue to live under the Iranian project for hegemony which today runs four Arab capitals. We also read and follow Turkey’s tumultuous hankering to go back to Ottoman times after turning the page of the Ataturk Experiment with all its possible regional ramifications. In the meantime, Arab division and disintegration gather pace, against a back drop of inflated snippy individualism, and delusions about what the future might hold for the Region. In Sudan, the South has already seceded and this may only be the beginning; and in some North African ‘Magharebi’ countries there are stirrings of dormant factional problems. In Yemen, too, the Houthi phenomenon, coming hard on heels of the Qaeda phenomenon is surely a worrying sign. However, the real catastrophe is that taking hold of Iraq and the Levant. The Kurds have decided on full independence from Iraq, and had things been more conducive, would have done the same in Syria. The truth is that as ‘inventing’ ISIS has brought down the Syrian popular uprising and rehabilitated Al-Assad Regime under US-Russian auspices and Iranian firepower, the transgressions of the reigns of Saddam Hussein and Nuri Al-Maliki have provided the leaders of Iraqi Kurds ready-made excuse to seek an independence that had really worked for all along, regardless of what they diplomatically claim today. Sure, there is no moral or political justification to oppose the Kurds’ right to seek independence, whether in Iraq or Syria, or even Iran and Turkey for that matter. But, as it is often said, ‘the devil is in the detail’. What sort of country will the new Kurdistan be? What are its borders going to look like? What political system will it have? What are non-Kurds to expect in a ‘nationalist’ Kurdish entity? The early signs in the ‘disputed areas’ are not encouraging. Indeed, during ‘the war on ISIS’ Iraqi Kurds made haughty pronouncements such as “the Peshmerga (the powerful Kurdish militias) will never withdraw any territory they liberate”; and then there is the volatile situation in the oil-rich mixed-race city of Kirkuk, and the issues of Tel Afar and the towns of the Nineveh Plain, without forgetting the bouts of ethnic and sectarian ‘cleansing’ in Diyala Province. Not to be outdone, Syria’s Kurds are steadily working to establish their ever-expanding Rojava ‘autonomous region’ at the expense of Arab, Turkmen and Syriac/Assyrian/Chaldean towns and villages; changing their mostly Arabic names in the process. Mr Masoud Barzani, president of ‘Iraqi Kurdistan Region’, who has insisted on including the ‘disputed areas’ in the independence referendum, is continuing to reassure world leaders that the new independent ‘Kurdistan’ would be a Northern Europe-style pluralistic democracy… but under the arms and banners of the Peshmerga. The Kurdish parties working for a Kurdish ‘autonomous area’ in northern Syria, which are also trying to impose its hegemony over mixed areas, claim they too are committed to ‘democracy’ and have been conducting ‘elections, under the watchful eye of what is attractively called “Syrian Democratic Forces’ which are actually dominated by the Kurdish People’s Protection Units (YPG) militia. This brand of ‘democracy’ does not reassure many living whether within or outside the Kurdish dominated areas. In fact, if helpless minorities find themselves willing to accept a ‘lesser of two evils’ when faced with two worse options: either living under Iran’s Shi’ite militia led by Qassem Suleimani or under ISIS, others do not feel compelled to accept such a scenario. Honest aspirations and goodwill, aside Kurdish leaders today face many serious doubts and strong opposition, and if Arab lamentable weakness cannot save the identity and sovereignty of Iraq and Syria, Iran’s and Turkey’s national interests may be capable of disturbing Kurdish calculations, and impose conditions of their own. On their part, it may be in the interests of the Kurds to be cautious in over-relying on international promises of support. They may be wise not to burn all their boats… even with the Arabs who are now the weakest player in the Near East. This article was first published in Asharq Al-Awsat. Eyad Abu Shakra (also written as Ayad Abou-Chakra) began his media career in 1973 with Annahar newspaper in Lebanon. 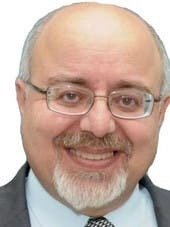 He joined Asharq Al-Awsat newspaper in the UK in 1979, occupying several positions including: Senior Editor, Managing Editor, and Head of Research Unit, as well as being a regular columnist. He has several published works, including books, chapters in edited books, and specialized articles, in addition to frequent regular TV and radio appearances. Eyad tweets @eyad1949. Does Macron bring a new dawn for liberal democracy?